Hideki Matsui got a chance to renew an old rivalry Wednesday. His performance might help him do it again soon in the Majors. The nine-year Major League veteran was 2-for-4 with a double and two RBIs while a rehabbing Kevin Youkilis doubled and scored as Triple-A Pawtucket beat Durham, 5-4, on Wednesday. After going 0-for-4 in his first game on Tuesday, Matsui doubled home a pair of runs in the first inning. He reached on a catcher's interference call in the third, singled in the fifth, hit into a double play in the sixth and grounded out in his final at-bat in the ninth. "It was good," Matsui said through his translator Roger Kahlon. "The situation was where we had runners on base and all we needed to score a run was to hit a ball hit into the outfield. It was a good situation and I was able to accomplish what was necessary." 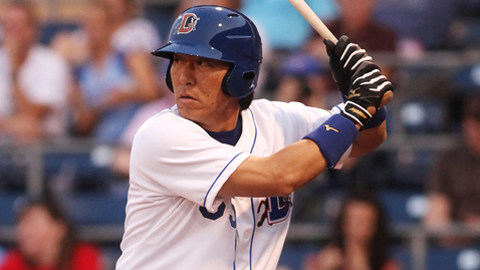 Signed by the Rays to a Minor League contract on April 30, Matsui had been playing in extended spring training before joining Durham. Not surprisingly, the two-time All-Star had no problem with nerves in his Durham debut on Tuesday. "It's not like the World Series," Matsui said jokingly. Matsui spent the 2011 season with Oakland, batting .251 with 12 homers in 141 games. The 37-year-old designated hitter played seven seasons for the New York Yankees after signing as a free agent following a 10-year career with the Yomiuri Giants in Japan. Youkilis, who came out for a pinch-hitter in the sixth, is working his back to the Majors after being placed on the disabled list on April 29 with lower back discomfort. In addition to his double, he walked in the first and flied out in the third while serving as the Red Sox designated hitter. On Thursday, Daisuke Matsuzaka is expected to start for Pawtucket in his comeback from Tommy John surgery. Facing off against two former American League East rivals mattered little to Matsui though. "I don't know if it's about old times or anything like that, but I think we are both working on getting back to the Majors," Matsui said. "I think we're just going to be focused on doing whatever we need to do. Hopefully everything works out." Over nine Major League seasons, Matsui has batted .285 with 173 homers and 753 RBIs. The 2009 World Series MVP is the only player to hit 500 homers between the Majors and Japan, but is unsure if he is ready to join the Rays quite yet. "That's a difficult question to answer," Matsui said. "I'm working towards getting back to the Majors, but it's not necessarily a question I can answer right now." Matsui has not spent much time during his career in the Minors, playing five games for the Tampa Yankees on rehab assignments in 2007 and '08. While he hasn't had much of a chance to familiarize himself with Durham, he likes what he sees thus far. "So far it has been good," Matsui said of his time as a Bull. "It seems like a beautiful town, the fans are great, they are really into their team. I haven't had enough time to get acquainted, but so far it's been good." Lars Anderson homered and drove in three runs while Jose Iglesias, Boston's No. 11 prospect, was 2-for-5 with a run scored. Alex Wilson improved to 4-0 after allowing a hit over 1 2/3 shutout innings of relief. Mark Melancon extended his scoreless streak to 13 innings en route to his fifth save for Pawtucket. Leslie Anderson collected three hits and drove in a run for the Bulls.